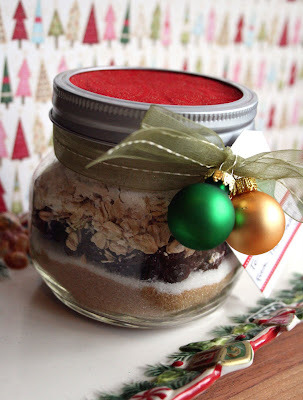 These cute little jars of cookie mix are simple and quick to make- and you can make a bunch at one time! I halved this particular recipe because I only had small jars to use and the family I was making them for is smaller, so instead of making three dozen, this jar will make one and a half dozen. Below is the full recipe and how to make your jar. Empty cookie mix in large mixing bowl. Stir to combine. Add 3/4 cup softened butter, 2 eggs slightly beaten, and 1 tsp. vanilla. Mix until completely blended. Roll heaping teaspoonfuls into balls. Place two inches apart on a lightly greased cookie sheet. Bake at 350 degrees F for 11-13 minutes or until edges are lightly browned. Cool 5 minutes on cookie sheet, remove to wire racks to cool completely. For my jar, I cut out a circle of Christmas fabric and attached it to the jar top and then screwed on the outer rim of the jar top. I tied a green ribbon around the jar and tied on two tiny Christmas ornaments that I got at the dollar store (10 ornaments for $1). I also attached a tag with a Christmas sticker and a "To: From" label and then wrote the rest of the recipe on the back.